So, you’re buying business software? Congrats! Welcome to the world of defining hundreds (if not thousands) of software requirements, interacting with a dozen or more people needing a say in your selection, a sea of regulatory and financial concerns, a dumbfounding array of software review/evaluation sites, very persistent vendor representatives and more. Sadly, it’s not – especially if you want to select the right software the first time. And if you’re replacing software, you definitely want to get it right this time. in-depth discussion of these tips, read on. You should know that nearly 70% of technology spend is wasteful. Don’t make that same mistake. Further, software selection (in many industries) happens many times a year. To better prepare you for this serious undertaking, we’ve outlined 52 key tips across 8 essential categories. Study these tips and check out a software selection platform to help you make use of these best practices. “It’s best to approach the process of selecting a new software application for your business like you would consider adding a new member to your senior management team. Before hiring a new C-level executive, VP or director, the focus is on how well the candidates can contribute and strengthen your company’s ability to reach its goals. There’s also the issues of cultural fit, ability to collaborate, proven track record in the industry and how quickly they can get up to speed and become a core part of your business. The same is true when selecting any new software application. The best selection processes are anchored in specific business goals, defining exactly what the expected contribution from the application is. Selection processes that are the most successful also evaluate how effective a proposed application is at fitting into the workflows and approaches your company does business today. Great software will not force you to change how you do business; it will have the flexibility of changing to match how you and your company work. And now for the rest of the tips in a somewhat particular order…. Define your project scope. Think about the full range of functionality that must be involved, the business goals to be met and how to put that into a set of requirements for a platform or set of tools. Risk assessment analysis. Looking carefully at risk is a responsible part of any good move, including software purchases. Take a categorical approach to figuring out how risk might apply to buying and implementing new technologies, and assess related issues like insurance, industry compliance, and more. Assign an internal champion. Nowadays, companies are often using inside people dubbed “champions” to interact with vendors and to manage the sale. Getting a champion in place will help you to expedite the procurement process. Get buy-in. Talk to stakeholders, present options and get consensus for a technology procurement project. That may involve negotiating the budget for tech or augmenting it with contingencies. Get people on the record with their support to avoid thorny decision-making challenges later on. Establish a budget. Look at how much each aspect might cost (e.g. license, implementation fees, training, change management) and what funds are available to pursue procurement. Knowing what you can afford ahead of time will ease many future conversations. Decide on what your expected ROI would be in both % improvement and time to ROI. Figuring out return on investment is a concrete way to look at the financial impact of the new service over time. Estimate what you expect for an ROI and how soon you’ll get there. Set a timeline and milestones to make the selection decision. Creating concrete timeline and setting specific milestones helps everything to go more smoothly, and helps you plan how new software will work, and what impact it will have on the business during a given year or set of years. It helps to make sure that things are going to go as planned, and not drag out or falter over time. Use a tool to manage the entire selection process. Tools related to managing procurement can really add some level of technical capability to your process. For example, some of these items could include documentation resources for things like training, support and even contract negotiation. A tool also helps organize all these steps being outlined into a complete audit trail. Review common feature sets of the category of software you are looking for. Contrast different vendor options and look carefully at what each ones does and doesn’t do. You can use a handy dandy software selection platform to compare the offerings and assess their differences, to find the best fit. Read buyer’s guides and updated market reports on the software category you’re evaluating. Look for particular criteria that have helped other businesses to make selections. Understand what’s important about the software, and how the best companies put the right features into their platforms. A buyer’s guide is like a summary: it presents the main points for you, and helps you to imagine how a product might help, or what might go wrong in implementation. Here’s a sample written by HR software selection and implementation expert, Jeremy Ames. Find out who leads the market. Look at leaderboards and analyst reports for the most popular products in the software category being evaluated. Check out who’s highly rated by a mix of 3rd party sites (e.g. Gartner, Forrester) in order to guide your decisions about getting the right kinds of tools in place. Look at things like review scores and community ratings to figure out how popular a certain platform is in its market. Find out who best fits your specific requirements. Every product is made for a slightly different set of uses. Figure out which companies’ products align with your particular needs — for example, due to your business size, your sales strategy, and any online pipelines you may use for customer conversion and other purposes. “Developing the requirements specification is the most time consuming part of the software selection process. However, a gap analysis based on a comprehensive requirements specification is essential to selecting the software that will return the greatest value to the organization. Know the difference between on premise and cloud-based. Research what cloud technology can do for your business by untethering server workloads from your in-house business space, and delivering functionality over the web. Here’s something to consider. Decide how critical mobile access is to you. Mobile is not the future, it’s now. Look at what types of information and functionalities are going to improve business processes when you can send them to any device anywhere in the field. Talk to IT about the implications of adding new technology to your stack. Address any potential challenges and costs of getting new platforms and tools into your IT architecture, including data migration issues, security challenges and more. Bring this information to stakeholders as necessary so everyone’s on the same page. Think about what customization may be required. Figure out whether you will have to tweak vendor solutions to make them relevant to your business, and whether that might affect other variables like increased workloads, learning curves and costs. Inventory your existing related technologies to see what you may need to connect (understanding things like APIs is helpful). Application programming interfaces or APIs are helping businesses to connect more different types of software together into a seamless architectures. Figuring out whether you can get in-house staff or consultants to link vendor software with APIs will help you decide how to implement new services. Many business-level softwares also offer native integrations to other software categories so find out if those options exist as well. Take a closer look at security. Let’s not forgot critical data breaches of recent: Target, Sony and more. What security issues need to be understood, e.g. database connectivity, private customer information storage, etc.? Where are the sensitive sets of data that need to be preserved from unauthorized access to avoid serious risk – and, just as importantly, when can those sets of data be hashed, encrypted, or substituted to make their transit safe? Address segmented security, as well. This often starts with endpoint security — how will security be handled at the ultimate point of destination, on display screens on laptops or, more commonly, mobile devices? And how will the enterprise handle the risks of endpoint ports such as USB ports? Along with endpoint security, take a look at your business network and how to understand how data travels through various domains, in order to monitor and improve security for each one. Eliminate vendors who don’t offer your most critical requirements. Look at your list of needs and discard vendor options that don’t have the core functionality that you absolutely have to have. Almost as important as finding the right vendor, culling your list of vendors that aren’t good fits saves you significant time. Ask about the development process. Have software products been thoroughly debugged? Have they gone through beta testing? Are they in beta still? In which cases have appropriate unit testing or larger tests been done? Knowing more about how products are tested prior to release will give you additional confidence that you are getting products that will work well for you. Know the vendor’s service level agreement (SLA). It’s essential to know the scope of services, including uptime/downtime. SLAs should have concrete downtime estimates attached. For example, a 99% uptime and 1% downtime means the service can be unavailable, according to contract, for approximately 3.5 full 24-hour periods throughout a year. Talk to vendors about when downtime will occur to handle it. Tune in to industry compliance. If you’re in a business even slightly related to healthcare, get serious about understanding HIPAA compliance for a new software set. If you’re in financial sectors where Basel or Sarbanes Oxley or other standards apply, make sure these are accommodated by the software in terms of the entire data transit process. Go back to consultants and find the best ways to address any outstanding compliance issues. Make a checklist of all the things you need to think and do as you decide (hey, I’m doing that for you!). You can use a spreadsheet, read some articles or, your best bet, use a requirements template and tool to manage your list. Make a list of all the pains you think the software can solve. Identify any problems in core operations that have come up, things that might be solved with an investment in technologies. Knowing your pains is a primary and fundamental part of knowing how to proceed with any change to a business. Define Requirements/Criteria. Make any informal lists or punch lists into a formal set of requirements that you can reference further down the line. Prepare your RFI/RFP. Do the research and delegate someone to actually write up a formal RFP to send to companies. Some requirements gathering tools also can turn your requirements document into a formal RFP document. Have all stakeholders rank and prioritize the requirements you’ve defined. After identifying these requirements, it’s important to rank them, so that you know what the priorities will be through the negotiation process. Make a list of the metrics that the software aims to improve. Look at what you commonly benchmark, or what you might benchmark, to establish how well the business is doing and where it is excelling. If you’re changing software, make a list of reasons why. Creating a pros and cons list is a simple way to look at benefits and disadvantages of new vendor services. Even the high-tech companies in Silicon Valley use these types of processes to brainstorm why they are doing something. Just like it’s part of agile software development, it should also be part of agile software procurement. Create a list of vendors. Compile a list of all the possible vendors. Use landscape graphics (example 1, example 2) and product directories to get an idea of what’s out there. Make a list of everyone who’s selling the specific type of software you need, to that you can have access to all of the choices on the market in order to make a decision. Get all stakeholders together that need a say in the software selection. Make sure all parties are included at every stage of the process. You may use diverse methods, from surveys to board meetings, or even eliciting written feedback from a number of people at any stage in the process. Keep it organized though so you have an audit trail for who made decisions and why. Distribute your RFP. In some cases, you may have to advertise an RFP or a take other steps for industry compliance. Make sure the RFP gets out to the target audience that you’re trying to contact. Here’s a good guide on creating an effective RFP. Ask for feedback from your peers/colleagues who’ve selected software in the category you’re evaluating what their experience and obstacles were. Go around and get ‘round robin input’ to figure out how these technologies might be used and what some challenges might be. This helps you to avoid some of the common barriers that keep businesses from enjoying the best return on new software acquisitions. Bring in a selection or implementation consultant if needed. When decisions go beyond the ability of staff, having a consultant on hand can be extremely valuable. In an ideal case, you could have these individuals on call, and ask them questions on a case-by-case basis. Write down sets of questions to ask these consultants, and determine the scope of their contract — how involved will they be in your purchase and implementation process? Shortlist your favorites. Narrow down your potential lists to selections that you think will make the most sense for your business needs. Your shortlist will guide you as you continue through the process. You’ll have to do less work, because you’re no longer just paging through the market, but working off of a list of specifically screened vendors that have a better chance of offering you best-fit products and services. Review case studies of your favorite vendors. In-depth case studies can give you insight into how other companies use these products. Case studies of companies closely related to yours (e.g. industry) are most appropriate as it will tell you better how the vendor will be able to meet your needs as well. Read software reviews of the products you’ve shortlisted. Software reviews! People rely on them so, but perhaps to a fault. It’s important to read what customers have said about specific products but it shouldn’t be your primary (or only) reference for selecting a software. While it is important to drill down and do detailed reading on the particular products you’ve put together, don’t neglect the other steps we’re outlining here. Demo and/or do trials of your favorites. 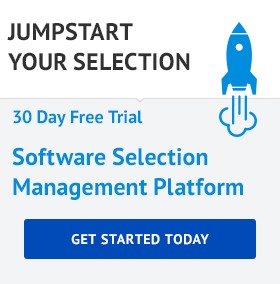 Many companies have free trials available for their software. Some even have interactive demos online. Take the time to take these products for a test drive to understand more about what each one does, and about how to use the particular interface, which is going to be important later on in the process. Perhaps save this step for your shorter shortlist as it can be time-consuming, especially going through a full-fledged trial. Request references for your shortlist. Reach out to these companies and ask them if they can provide references that show more about their track records and histories of what they have provided to customers in the past. This is just one way of doing the “due diligence” that ensures you are selecting the best vendor. Research your shortlist. Read non-customer reviews/news e.g. financial performance, corporate news, etc. to make sure you’ll be doing business with a viable and trustworthy organization. Vetting the company is another critical step in that chain of finding the best vendors, not just someone who’s willing to sell you software. Just like in the hiring process, securing vendors should mean doing the background work to make sure you’ll be in good hands later on. Understand pricing. Talk to the vendor at length about what pricing options are available. Is subscription pricing available, which will allow you to benefit from “on-demand” services and add or subtract servicers month after month as needed? Are there multiple pricing options, for example, a “Basic” package or a “Gold” or “Premium” one? Also, what are the payment options? What’s more convenient for your budget and schedule? With the advent of new cloud and web-delivered services, pricing structures and packages are more important than ever, and vendors should be able to present attractive options. Start thinking about how to negotiate contract details. Start to look at sample Service Level Agreements (SLAs) or other contract documents to figure out what sort of costs you’d be looking at, and how you can influence vendors to provide products and services in a way that’s more to your advantage. Sign contracts. Make the agreement final with the selected vendor. Make sure all stakeholders know about this change and start fostering enthusiasm about the products and services to get a better chance of a successfully implementation and adoption. Make a commitment. Cultivate connections with the vendor while doing even more research about the new products and services that are going to be part of the enterprise architecture. Stay engaged as the beginning steps occur — as people get trained, as functionality gets added to the existing systems, and as these changes actually start to affect internal operations. Generally, a (great) vendor becomes an ongoing proactive partner with you but your organization should commit the same. Understand the implementation requirements of your shortlisted solutions. Ask in-house IT staff or others about exactly how you’re going to blend the new product into your existing architecture. This is where all of your research on APIs and other tools becomes concrete and pragmatic. You may face problems related to manual data entry or a lack of connection between platforms that makes some types of combinations impractical. Create a change management plan. This is one of the most important steps in the entire process. You’re going to encounter change, so it makes sense to have a change management plan in place. This can cover the massive process of training people in new technology, as well as other aspects, such as a change in how people access data, and other changes to business processes that, if not documented and planned for, could be disruptive to business as usual over a long period of time. Make a list of the people who are going to need to use it and what they’ll use it for. One way to make training more precise is to figure out that list of ‘power users’ and how they would need to be prepared to use a new tool accurately and efficiently. When you have that list of key people, you can also start looking at Identity and Access Management and other protocols to fit a software setup to your business needs. These people would likely be influencers in your decision process as well. Assign a tech liaison between IT and the department requiring the software, e.g. marketing or accounting. The tech liaison will serve an important role after the contract is completed — by keeping the channels of communication open for ongoing management and troubleshooting any problems that might arise. Since it’s become more common for business units other than IT to select technology, establishing this liaison is key. Lastly, take a deep breath. As you can clearly see now from the extensive tips above, the software purchase process is complex. That doesn’t mean they have to be a drag or a burden. You and your organization should be excited to be acquiring technology that is going to move your business forward. Remember, you’re trying to give your company the best chance of taking advantage of its new capabilities the right way, and benefiting from an informed, profound and thoughtful long-term relationship with a third-party vendor. We tried to cover all the key areas in the software selection process but maybe we missed 1 or 9 things you think are key. Let us know in the comments and we’ll add it in – giving you credit in the process. One last note…SelectHub is, in essence, “software for buying software”; we help with nearly everything outlined above. Give us a gander.